Frequently Asked Questions | Gainesville Florida | Paddle Florida, Inc. I don't have my own boat. Can I rent one? Yes. Paddle Florida partners with local outfitters for each trip and they'll be able to furnish you with a canoe or kayak, paddle, PFD, and spray skirt. On our website, each trip page contains a link to our partnering outfitters. If you're bringing your own canoe or kayak, then bring all the associated things you normally would on a day paddle: paddle, PFD, spray skirt, water bottle, hat, sunscreen, and camera. For camping, you'll also need a tent, sleeping bag and pad, pillow, camp chair, flashlight or headlamp, and enough clothes (including rain gear) and toiletries to last the duration of the trip. It's often best to dress in layers…evenings and early mornings can be a bit nippy, but paddlers typically shed warm outer layers throughout the day. Bring a bathing suit and towel so you can enjoy a refreshing dip in a spring or snorkeling over reefs. Paddle Florida staff will shuttle your camping gear to each day's campsite so that you don't have to weigh down your boat with it. Are there bathrooms and showers at every campsite? Bathrooms—yes. Though in some of our more remote locations, they might come in the form of a porta-let. All of the state parks and private campgrounds we stay at offer hot showers. But again, our more remote trips (i.e., Ochlockonee River in the Panhandle) involve some primitive campsites without showers. Paddlers on those trips may have to trade some hot showers for a jump into a refreshing river or spring. How many miles are we expected to paddle each day? Mileages vary from day to day and trip to trip, ranging from 7 to 21 miles. We typically get on the water each day between 8-9AM and most paddlers arrive at camp by mid-afternoon without having to strain themselves. Paddling with river currents also helps to ease each day's journey. We also coordinate lead and sweep boats on each day's paddle to ensure safety. What if the weather turns sour? Paddle Florida has been lucky in this regard…over the course of 22 trips, we've not had to cancel one day of paddling due to inclement weather. Scheduling trips during Florida's cooler months (October through March) helps these odds, but of course weather isn't something we can control. We advise paddlers to tuck rain gear in their boats in case a shower strikes while they're out on the water. Packing a set of warm, dry clothes in a dry bag for your boat is also a good idea in case you get wet and cold from an unscheduled swim. The safety of our paddlers is of utmost concern. If weather conditions ever make paddling unsafe, we will make arrangements to shuttle paddlers and their boats to the next day's campsite. However, paddlers should be comfortable paddling within a range of typical wind and water conditions, from glassy seas to a small chop. Are Paddle Florida trips appropriate for stand-up paddle boarders (SUPs)? Stand-up paddle boarding is the fastest growing segment of paddle sports and we're just now starting to see interest in our trips from this group. 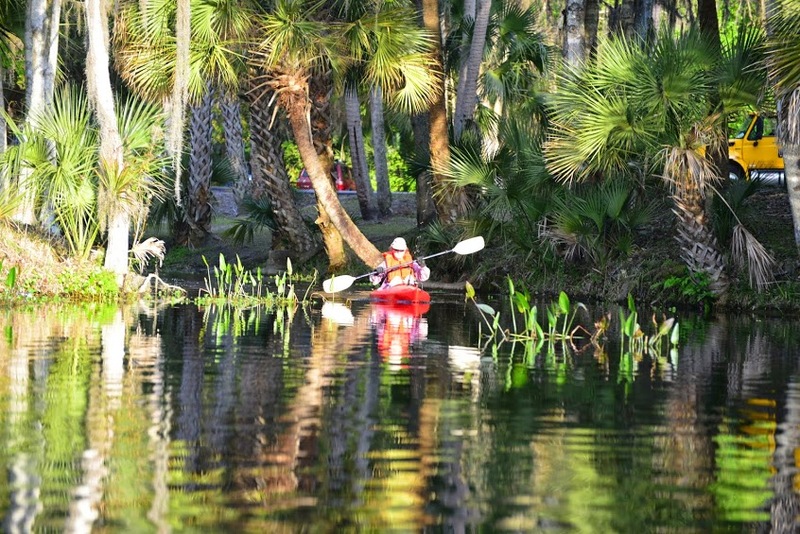 Paddle Florida's shuttling of all camping gear makes it possible for SUPs to enjoy a multi-day trip. Of course, certain waterways are more conducive to the sport than others. Daily mileage is another factor and we urge SUPs to check out the itineraries of each trip to see if they appear manageable. How experienced and skilled of a paddler do I need to be to enjoy a Paddle Florida trip? Our paddlers literally range in age from 8 to 80. Some have decades of experience paddling canoes or kayaks; others are new to the sport. Given the support we provide with meals, gear shuttles, and lead/sweep boats, our trips are ideally suited for someone who's never gone on a multi-day paddling trip before. Minimally, we recommend paddlers have experienced a few day trips of at least four hours each before they come on a Paddle Florida trip. We enjoy transforming newbies into veteran paddling enthusiasts! And no one needs to be a world class athlete to enjoy our trips. Tell me about the meals. Paddle Florida partners with regional caterers to provide hearty breakfasts and dinners in camp each day. Additionally, we set up a lunch stop along the river during longer mileage days so that paddlers can take a break and fuel up. (On shorter mileage days, we'll send paddlers off in the morning with their lunch snacks.) For special needs menus, please contact us at 352-377-8342. Will I be able to swim, snorkel, dive, fish, bird, hike…? Absolutely! Our trips are not so regimented that you won't have time to thoroughly immerse yourself in the natural beauty you're paddling through. Our daily mileages permit plenty of time for breaks to stretch your legs, swim in a spring, fish, bird, and sightsee along the way. Many of the state parks we camp in have excellent hiking trails. Bring snorkeling or diving gear and explore a clear beautiful Florida spring or abundant sea life on a coral reef. Are Paddle Florida's trips appropriate for kids? YES! What could be better than an extended stay in nature's classroom? We've had parents (and grandparents) partner up with smaller children in tandem kayaks or canoes to ensure their junior paddlers could manage the daily mileages. Kids not only relish their adventures on the water, but usually also enjoy tent camping, camp fires, and the educational programming and concerts we schedule in the evenings.